If you’re hopping over from the Daily Science Fiction e-mail blast of “The Bargain”, welcome! If you’re not…welcome anyway! As promised, here are the two images that prompted this very short story. 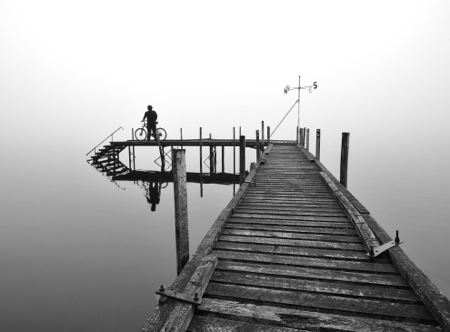 The first features a man standing with a bicycle at the end of a pier, monochrome in the mist, the lake’s water a sheer mirror. Why is he there? Has the rest of the world really disappeared? What lies beyond the mist? Where is he going? Where has he been? 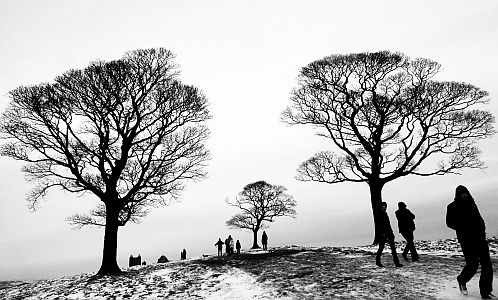 These questions and this haunting image were the primary inspiration. It’s a standard creativity exercise to link two or more disparate ideas together, so into the mix was added this devilish character, who turns out not to be a demon at all but a man dressed in traditional Austrian Perchten costume and mask. Add a final tip of the hat to E. L. James…and “The Bargain” was the result. Thanks to Ilan Lerman for excavating the prompt images and to Georgina Bruce for her inspired suggestion to bisect the story — it was originally twice as long and more purple than grey. When “The Bargain” goes online at Daily Science Fiction a week after this Monday’s e-mail shot, it will be accompanied by the art for the month of May 2013. By sheer coincidence, it’s a perfect fit.